To generate smart banners, you can use either the whole feed or individual products that you filtered for. On the ad group editing page, click +New filter and add up to 50 filters connected by the conjunction “OR”. To configure the filter, select your target audience, set the product selection rules, and specify the CPC (for the “Optimize the number of clicks” or “Optimize the number of conversions” strategies). Showed interest in similar products — for users who searched for similar products on the internet, but did not visit your site. Ads will be served in search results and in ad networks. Viewed products on my site — for users who visited your site and viewed specific products. Ecommerce must be configured in Yandex.Metrica for this option. Ads will only be served in ad networks for the selected audience. Ads will not be served on search. Both groups — in the networks, ads will be served to users who have been on your site or searched for similar products on the internet. On search, ads will only be served to users who have shown interest in similar products. Ecommerce must be configured in Yandex.Metrica for this to function correctly. If ecommerce is not configured, smart banners will only be shown to users who search for similar products on the internet. You can use bid adjustments to raise or lower the CPC when you serve ads to particular users. The selection rules will determine which products from the feed will be used and which ones will be excluded when generating smart banners. You can select products by different parameters (such as category, price, and so on). For correct selection in the feed, there must be a product with the specified parameter. The parameter value must match the value in the filter. These attributes depend on the business feed type. You can use the feed tree to conveniently select products within the same category. Select a category or sub-category of products in the tree. 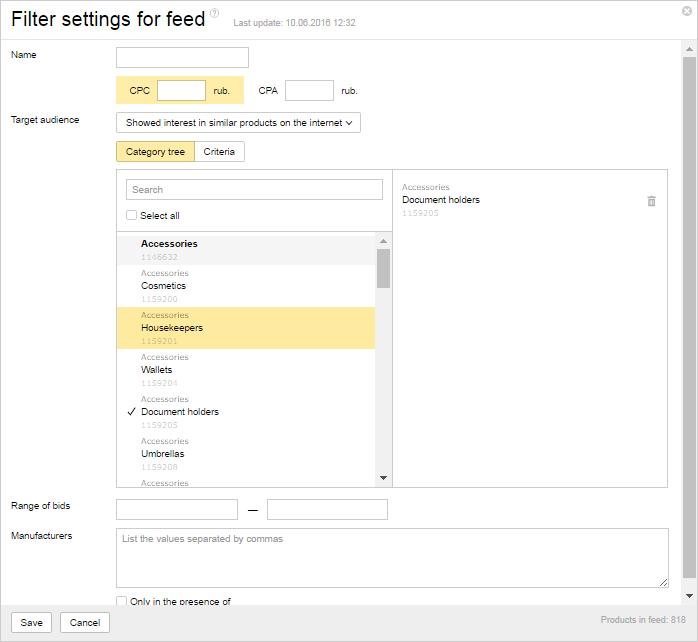 If you selected the “Optimize the number of clicks” or “Optimize the number of conversions” strategy, you can assign the CPC or CPA in the filter settings.